ITB - Intermediate Transfer Belt assembly. This transfer kit includes a transfer belt assembly for the HP Color LaserJet CP3525, CP3525n, CP3525dn, CM3530, M551, M570, M575 series series printers . You can save money by purchasing the transfer kit on exchange -- see exchange terms in details below. 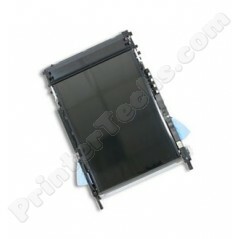 HP part numbers CC468-67927 and CC468-67907, RM1-4982, RM1-8141. Intermediate Transfer Belt, ITB, also know as a Transfer kit. This part is sold on exchange. We send you a part and you send back your old part in the same box. Easy! Purchasing a part on exchange saves money and prevents salvageable parts from ending up in a landfill. By purchasing a part on exchange you are agreeing to send back your used part (core) within 30 days of purchase. We will periodically email core return reminders at the email address given with the order. If the core is not received within 30 days a core charge will be issued to your credit card. Please send the core back in the original packaging along with the included return authorization sheet. Return shipping charges will be your responsibility.